The Rotary Club of Kapolei will collect school supplies on Saturday for underprivileged elementary schoolchildren in West Oahu. 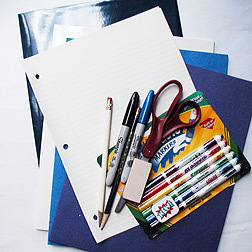 From 9 a.m. to 1 p.m., bring pencils, composition books, loose-leaf paper, rulers, crayons and other items to the Kapolei High School teacher's lounge. Call Sonya Mendez at 228-4499 or the 24-hour information line at 674-2500.